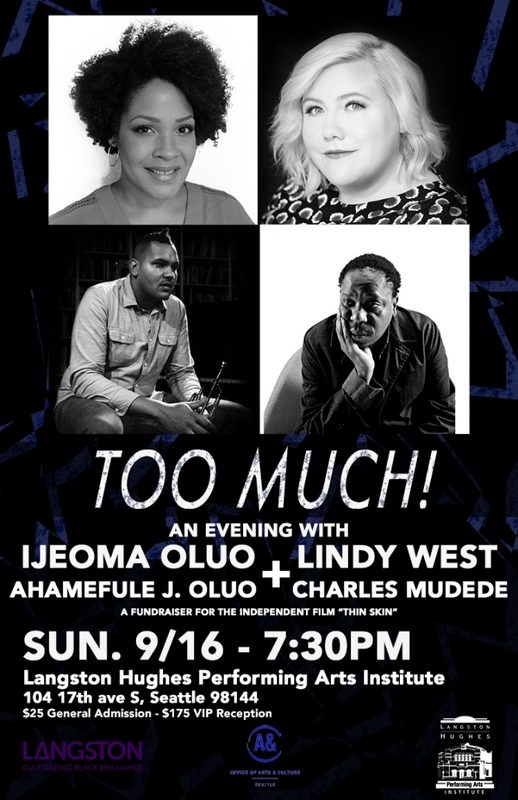 Please join New York Times bestselling authors Lindy West (Shrill) and Ijeoma Oluo (So You Want to Talk About Race), along with The Stranger’s Charles Mudede and musician/comedian Ahamefule J. Oluo for Too Much! !—an evening of race, bodies, laughs, trumpets, and maybe a few tears. This event features four of the creative minds behind the upcoming independent film Thin Skin, based on the stage show NOW I’M FINE by Ahamefule J. Oluo. All funds will go to the production of this film. There will be a pre-show VIP reception where you can have a glass of wine and meet the artists! VIP reception tickets are available via the ticket link. Lindy West is a columnist at The Guardian, a contributor to This American Life, and a freelance writer whose work focuses on feminism, social justice, humor, and body image. Her work has appeared in the New York Times, Cosmopolitan, GQ, Vulture, Jezebel, The Stranger, and others. She is the founder of I Believe You, It’s Not Your Fault, an advice blog for teens, as well as the reproductive rights destigmatization campaign #ShoutYourAbortion. Her first book, SHRILL, has made the New York Times Best Seller’s list. It has been adapted into a television series which was optioned and put into production by HULU. Ijeoma Oluo is a Seattle-based Writer, Speaker and Internet Yeller. Her work on social issues such as race and gender has been published in The Guardian, The Stranger, Washington Post, ELLE Magazine, NBC News and more. She has been the Editor at Large at The Establishment since 2015. Her NYT bestselling first book, So You Want To Talk About Race, was released January 2018 with Seal Press. Ijeoma was named one of the Most Influential People in Seattle by Seattle Magazine, one of the 50 Most Influential Women in Seattle by Seattle Met, one of The Root’s 100 Most Influential Americans in 2017, and is the recipient of the Feminist Humanist Award 2017 by the American Humanist Association. Charles Tonderai Mudede is a Zimbabwean-born cultural critic, urbanist, writer, and filmmaker. Mudede collaborated with the director Robinson Devor on two films, POLICE BEAT and ZOO, both of which premiered at Sundance. POLICE BEAT is a part of the Museum of Modern Art’s permanent collection, and ZOO was presented at the Directors Fortnight at the Cannes Film Festival. Mudede is a co-screenwriter for YOU CAN’T WIN, which stars Micheal Pitt and James Hong and will be released in 2017, and is currently the film editor for The Stranger, a Seattle weekly. Aham is a Seattle-based musician, composer, writer, and stand-up comedian. Oluo is a founding member of and trumpet player in the Stranger Genius Award-winning jazz-punk quartet Industrial Revelation, and was featured in City Arts Magazine’s 2013 Future List as one of Seattle’s most promising artists. Oluo has collaborated with such diverse acts as Das Racist, Macklemore, Hey Marseilles, and TacocaT. He was a semi-finalist in NBC’s Stand Up for Diversity comedy competition, and co-produced comedian (and writing partner) Hari Kondabolu’s albums Waiting for 2042 and Mainstream American Comic, for Kill Rock Stars. He was the first ever artist-in-residence at Seattle’s Town Hall, and in 2015 he appeared on This American Life and received a Creative Capital Award. In 2016 Oluo was awarded Artist Trust’s Arts Innovator Award, and the performance of his autobiographical musical “Now I’m Fine” at the Public Theater in New York City was called “dizzying,” “engaging,” and “grand” by the New York Times.